I just discovered QBrushes a great resource for Photoshop brushes. All the ones I’ve looked at have been Creative Commons licensed with an Attribution license, which is awesome. 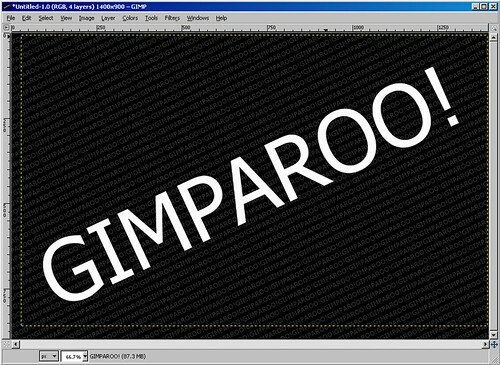 If you didn’t know, all GIMP versions greater than v2.4 can load Photoshop brushes. 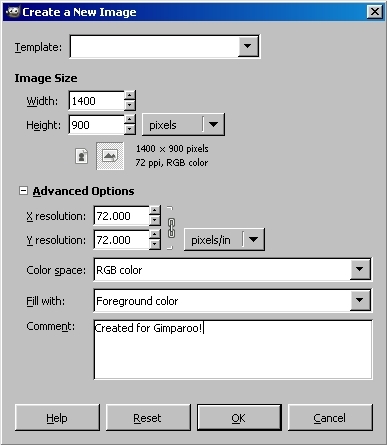 To do it, you need to figure out where the GIMP stores your brushes and just copy the .ABR files to that location. You can find out where by clicking Edit > Preferences. Expand the Folders list and select Brushes. There should be a path with the writable option selected. That is where you should save your brushes. I will probably create a new page for this blog with resources like this that I use frequently. Once it’s created, I’ll post about it. Edit: Check out the Resources page. I’m going to do another typography tutorial today. This time it will be number 6 from the list. This is another one that is quite simple to do, yet produces a really neat effect. The original is called Create Smokey Typography in 12 Steps written by Tom over at PSDFan.com. Okay so to start off, we’re going to need some images of smoke. I found the following on flickr.com searching their Creative Commons by-nc-sa section, which is a fantastic resource. I opened all these photo’s in the GIMP and desaturated them and inverted their colors as necessary so that the smoke is white and the background is black. Minimize those windows or otherwise set them aside for later. Open a new document, black background 600×125 pixels. Next add some text to your document. Any font will do. I chose a bold sans font. 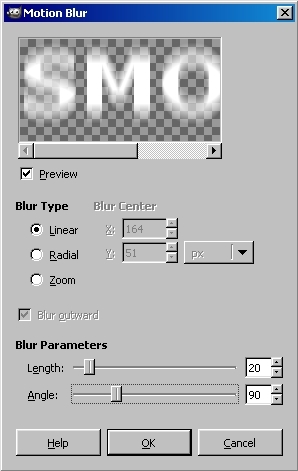 Now, duplicate your text layer, select the original text layer and click Filters > Blur> Motion blur… In the motion blur dialog, select Linear for the type, make the length 20 and the angle 90. Now, this will only blur in one direction, so it will have the effect of moving your blurred text upward. Select the move tool (M) and use your arrow keys to move the active layer down until it lines up the way you want. Also, lower the layer opacity to 60%. Now, bring up one of your smoke images. You can either use your selection tools to select an area of the smoke or just select all and copy and paste the smoke into a new layer in your image. Once you’ve got the layer anchored, set its Mode to Difference. Now, take a soft fuzzy eraser at low opacity and erase around the edges of the smoke until you can’t see the hard edges of your selection. You might even want to reduce the opacity of the layer a bit. Now just keep repeating the previous technique with different smoke images until you have something that looks good. Now, paste in one more smoke layer and set the layer mode to Multiply. Use your eraser to erase some of the layer so you can see the smoke and letters again. Now, select the text layer that we did not blur earlier. It should be higher in the stack than the blurred layer. Right-click the layer and click “Layer to image size”. This will set the layer boundry to the same size as the rest of the image. Select the Smudge tool (S). Select the Circle Fuzzy (19) brush, Scale 1.00 and rate 50. Using small circular motions, smudge those letters until they look more smokey. I chose not to do the last part where he did random brush strokes on the page. It seemed very out of place to me, and not everyone is going to have a drawing tablet and pen. However if you want to do that, you can get into the brush dynamics by selecting the paintbrush tool and clicking the plus sign next to Brush Dynamics. That’s it. I hope you enjoyed the tutorial and maybe learned something new. I’m adapting one of the tutorials mentioned in the previous post. It’s from PSDFan and it’s titled Create a Simple, Professional Typographical Design. 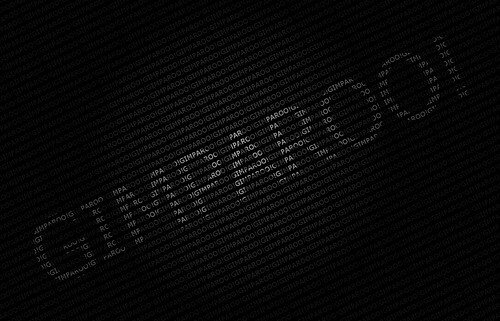 As noted, this is a simple effect, but produces a very nice design which could be used for a wallpaper, logo, or maybe a business card. Open a new document whatever size you like with a black background. I’m going with 1400 x 900. In order to make the next part a little easier, I maximized my image window so I can see the gray area around the border. Now, select the text tool by pressing T, change the color to 323131, and drag a text box completely around the image. Type in whatever text you want using all caps, and copy/paste it over and over until it fills the screen. Now, select the rotate tool by pressing Shift+R. In the rotate dialog box, enter -25 for the angle and click the Rotate button. Mine still ended up being a little small, so I selected the Scale tool by pressing Shift+T and stretched it a little until it covered the entire canvas. Now, create a new layer and select the text tool again. Set the color to white and the size to 250, or whatever makes it the right size for your image. Input your text, then rotate the layer -25 degrees just like above. Use the Move tool (M) to position the text in the center of the page. Set the text layer to Soft light, and duplicate it in order to make it stand out more. Adjust the opacity of the duplicated layer until you have something you like. Now, select the Gradient tool (L). 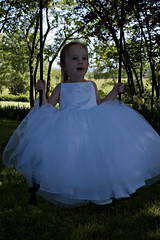 Set your foreground color to white and background color to black. Set the gradient tool mode to Normal and the shape to Radial. Create a new layer and set its mode to Soft light. Click and drag the gradient from the center of the page to the top edge of the layer boundary. Adjust the layer opacity until you have something you like. I lowered it to about 77%. You should now have something like this. That’s it! I hope you enjoyed this simple tutorial. Web and Designers has a great list of their top 30 favorite text effect tutorials done in Photoshop. I think I’ll endeavor to cover a few of my favorites in this list as well as any you’d like to see. Leave a comment with your favorite, and I’ll get to work on a few of them. PolishLinux.org is an informational site aimed at helping Linux/BSD newcomers choose a distro that’s right for them. I found them while searching for comparisons of Debian to Ubuntu, and they helped me decide that I’m going to stick with Ubuntu. While I was there, I noticed they have a Gimp tricks section, where you can find a few nifty tips. Go check them out, I’m sure they’ve got something to interest you. I do a lot of coding in C, Perl, HTML, CSS, and coming this semester, Java. I’ve used vim pretty much exclusively, but have recently started wanting to use my mouse when it’s feasible. So, I started looking around and being disappointed for one reason or the other with each of the offerings. First, I tried TextWrangler which almost did it except I didn’t like the way it handled Perl syntax highlighting, and I didn’t like the automatic indenting implementation. I tried a couple of the commercial selections such as TextMate and SubEthaEdit, but seriously, if I have to pay for them, I’ll just stick to vim. Then I found Smultron. It does a nice job of syntax highlighting and the automatic indent is implemented just the way I like. There is page after page of customization options. It’s also open source, which you all know I love. When I’m accessing my server remotely, vim will still work of course, but for homework and projects, I’m giving Smultron a try. Sorry there haven’t been more posts lately. Here’s some fluff. Pictures of my daughter’s toys in fun positions. Have a look. Hi there! 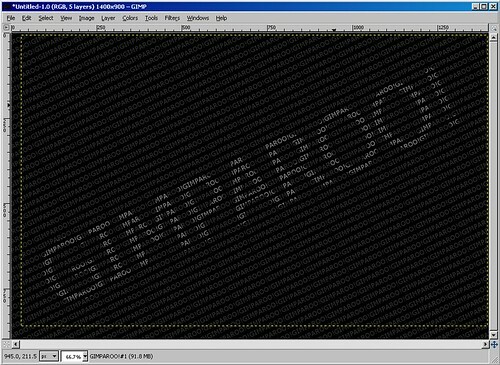 We are bunch of Gimp Fans, who try to provide a proper version for the mac. We are not related to gimp.org. We just admire their work. I’m downloading their 2.4.1 port now! This post does not have anything to do with the GIMP. If you don’t care about Linux server administration, you should just skip this post. I run a very small Ubuntu LAMP server that I use for small tasks such as Perl and C programming and a personal wiki. This morning, I was checking out /var/log/auth.log, and noticed multiple login failures for user ‘root’ from a strange IP; specifically 60.28.201.57. A whois lookup revealed that the IP was from China. The activity is typical of brute force cracking, so I started to get a little worried. Thinking I’d have to bite the bullet and install a firewall, something I didn’t want to do due to the very small amount of resources this server has, I did an apt-cache search for ‘firewall’ and began the tedious process of reviewing the results. Well, I didn’t have to look long. Not far down the list was an entry called ‘denyhosts’ with the description: an utility to help sys admins thwart ssh hackers. Well this is exactly what I’m trying to prevent, so I went to their website and read up. It sounded perfect, so I went ahead and installed it. Immediately after install, I got a system message saying I had email. The email informed me that IP 60.28.201.57 had been added to the deny list. Wow! That was fast, and easy. I literally didn’t have to do anything. That’s the kind of tool I like! It’s also FOSS, and in the Ubuntu repositories. In short, if you host a LAMP server, even if it’s not Ubuntu, I highly recommend DenyHosts as a simple solution for preventing this type of attack.